Completed in 1912, Portland’s Steel Bridge is the only double-deck bridge with independent lifts in the world and the second oldest vertical-lift bridge in North America – after the nearby Hawthorne Bridge just a stone’s throw down the Willamette River. 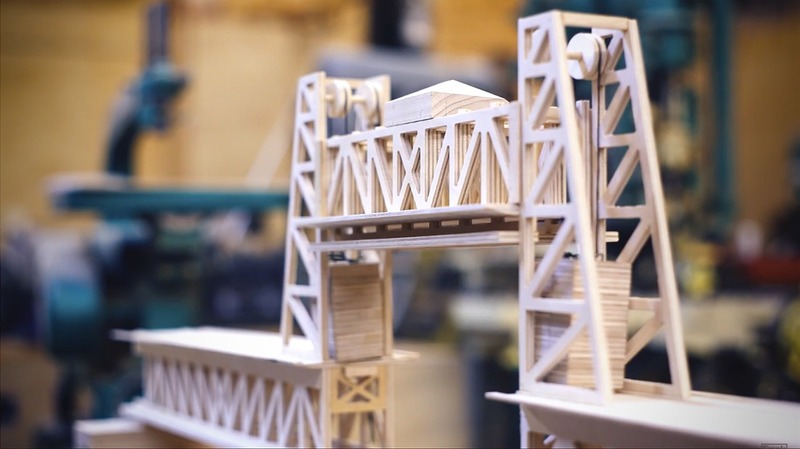 For his 3rd-grade son’s recent school project, our woodworking YouTuber Frank Howarth of Frank Makes recently took on the task of building a scale model of the iconic Portland bridge– well, helping his son build a scale model using AutoCAD and his shop’s CNC router. Unsurprisingly, the result is rather clean for a 3rd-graders project, but what else would you expect from a dad that has a woodshop like Frank’s?